Early spring brings European Starlings to the yard and they are tenacious about sticking around to eat as much seed, suet and mealworms as they can get from feeders. They are also very messy eaters, often sweeping a lot of seed out of platform and hopper feeders onto the ground. This year I put my hanging hopper feeder away temporarily because they kept dumping the seed onto the ground for the squirrels to eat . . . BUT, this past week I had a brainstorm that I think has stopped the dumping. The Birds Choice hanging hopper feeder I am using is small; the trays are only about 6 1/2” wide but have a little bit of a lip to keep seed inside them. The starlings stick their beaks in the tray, open them wide and flip them around, tossing seed on the ground. Gravity keeps moving more seed down into the emptying tray and they keep sweeping it out until the feeder is empty and all the seed is on the ground. Ironically, the starlings don’t usually go down on the ground to eat what they spill. Other birds will eat some of it, but the squirrels usually get the bulk of it. I have all my feeders well protected from squirrels, so this is frustrating. The trick is to stop the bill sweeping. For starlings, that means dividing up the tray a bit so that birds need to pick out the seed. To do this, I cut a piece of chicken wire to snugly fit the inside width of the tray. I added about a half inch extra on the back end to bend up into the hopper feed to hold it in place and about a half inch extra on the front end to bend down right at the front lip of the tray. I made sure not to leave any sharp edges exposed that might cut a bird. Now when I pour seed into the hopper and it feeds into the tray, there is a layer of chicken wire over it. (Note: I fill this feeder with safflower which flows easily. I haven’t tried this with other types of seed.) 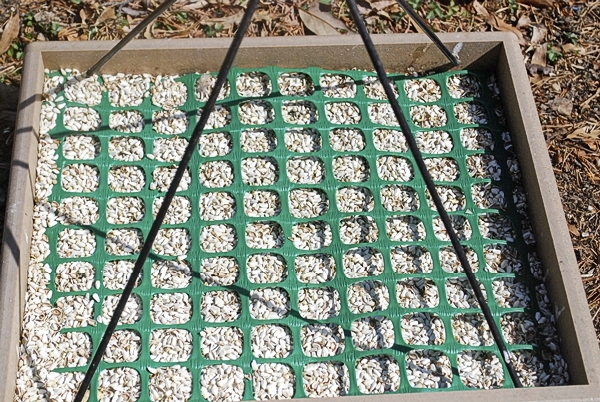 The chicken wire creates 1” wide circles of access to the seed. The starling can no longer quickly and repeatedly spread his beak wide to rapidly sweep the seed out. He can still use the feeder, but he needs to use better table manners. When I put up my doctored feeder, several House Finches popped up on it right away and had no issues with the chicken wire. The Northern Cardinals started using it a few hours later and they seem fine with it too, as are Carolina Wrens. I have not seen any Mourning Doves get on this feeder since I added the chicken wire and this is a feeder they would otherwise occasionally use, but I got this one as an alternative feeder for cardinals and finches to use when the Mourning Doves are all over the platform feeders, so that is actually just fine. 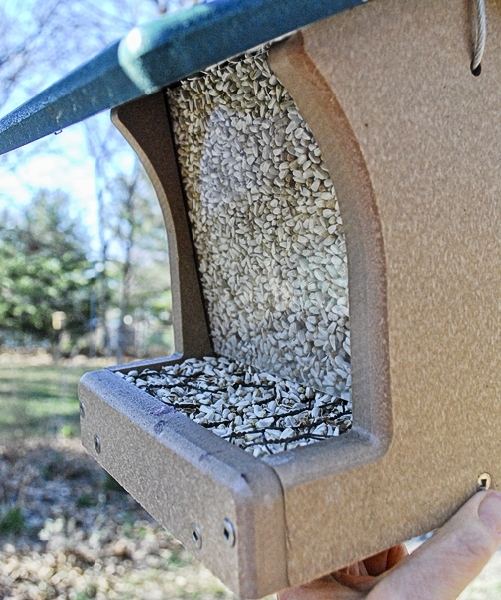 As I write this, it has been almost a week since I tweaked this feeder. 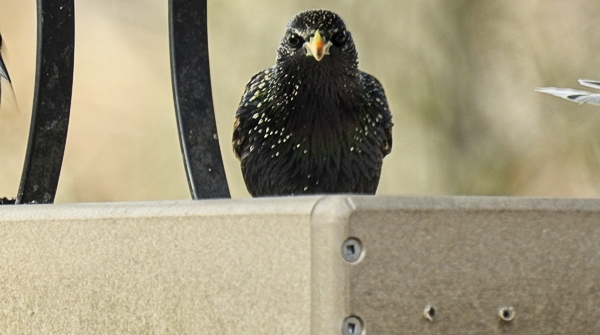 There are still obnoxiously behaving starlings in the yard at other feeders but they now mostly leave this one alone and the seed dumping from this feeder has stopped. Once in a while I’ll see a starling on this feeder but so far only for short periods and he is not making a mess. The plastic mesh cuts easily to size with a regular pair of scissors and you don’t have to worry about sharp edges or rusting. The holes are just a little bit larger and more square than circular. 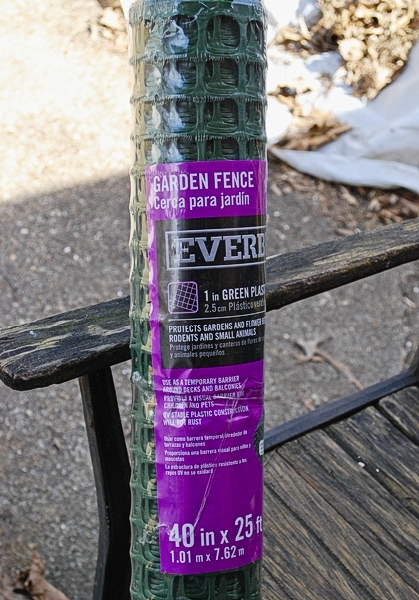 (Note: I purchased the plastic mesh fencing at Home Depot. Lowes lists a poultry mesh fencing that has the more traditional octagon shaped holes.) It won’t hold its shape the way metal chicken wire will, so I’m not sure it would work the same way in my little hopper feeder where the seed would need to move under the wire. For the platform feeders, I cut the plastic mesh to snugly fit the inside dimensions of the tray and laid it on top of the seed. So far the House Finches, Northern Cardinals, Carolina Wrens and Mourning Doves who are the usual customers in these feeders are fine with it, although the first cardinal that got on one of these doctored feeders cocked her head and looked at it a bit dubiously when she first encountered it. Other birds I’ve seen on this mesh covered feeder include two that I’m not big fans of, Common Grackles and Brown-Headed Cowbirds. Red-Winged Blackbirds are ok with it too. Starlings will still use the feeders with the plastic mesh but I do think it forces them to slow down a little. Instead of frantically stabbing their beaks seemingly every which way and opening them wide to sort through the seed, they have to slow down and aim a little bit. There doesn’t seem to be as much seed flying around. It’s not a huge difference but I think it does help a little. It doesn’t deter them from the using these feeders but it does slow them down and that seems to make them just a little less attractive to them. Before too long, the weather will be warm enough that the starlings will probably be spending more time off looking for bugs and will leave the feeders mostly alone. But this little tweak with the chicken wire let me put my hopper feeder back into use a little earlier than I expected and the mesh is slowing them down on the platform feeders. So that’s a win. Like this blog? Use the link at the bottom of the (full site) page to subscribe by email so you’ll never miss a post! I am a participant in the Amazon Services LLC Associates Program, “an affiliate advertising program designed to provide a means for sites to earn advertising fees by advertising and linking to amazon.com.” If you use an affiliate link on my site to go to Amazon and make a purchase within 24 hours, it helps me out because I earn a small fee which helps offset blog related costs. I only use these links for products I’ve used myself unless specifically noted otherwise. Hi Brian, I think your 1/2″ mesh would be worth trying. The starlings gape their beaks open pretty wide, definitely more than 1/2″, so it seems like that might make it hard for them to throw seed around. I have been thinking about cutting a second piece of the plastic mesh I’ve got (since I have a bunch left) so that the mesh wouldn’t line up exactly when layered over the first piece, making the openings smaller. I think two layers of the plastic mesh would probably be be getting too complicated in the feeder for permanent use but might be a way to experiment to see if a smaller size mesh would work better. I think if I was going to use metal mesh in one of my platform trays, I might play around with bending all four edges down just a little bit and/or taping the edges in some way to make sure I didn’t leave any sharp edges. If you try it, let me know how it goes ok? All content of this site is copyrighted Nancie Waterman 2013-2019 unless credited to someone else (who probably then has copyright on it.) Please always respect copyrights. Thanks!